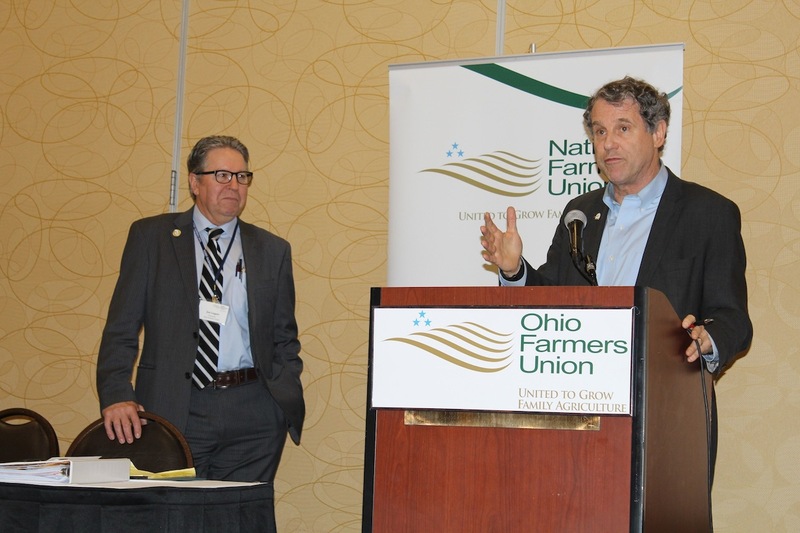 U.S. Sen. Sherrod Brown, D-Cleveland (right), and Ohio Farmers Union President Joe Logan, discussing priority issues at the annual OFU convention. COLUMBUS — The Ohio Farmers Union continued its call for mandatory country of origin labeling of meat products during the organization’s annual convention, Jan. 29-30 in Columbus. 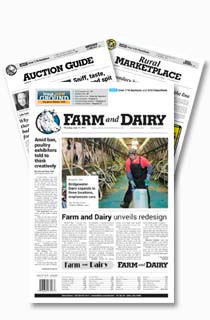 A wide range of topics were on members’ minds, including concerns over the recently announced federal trade agreement with pacific nations, and the spike in farmland taxes. But the issue that got most attention was labeling — better known as COOL. Roger Johnson, president of the National Farmers Union, said COOL policy has shown up in farm bills since 2002, including the most recent farm bill in 2014. But each time, the rule has come under criticism from larger-scale producers, who don’t believe a label should be mandatory. Johnson said consumers want to know where their food comes from, but the industry doesn’t want to tell them. “Consumers overwhelmingly want to know more about their food, producers overwhelmingly want to tell them more about their food, (but) big meat packers don’t want that to happen,” he said. 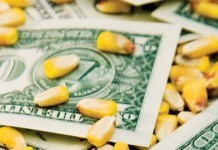 With passage of the 2014 farm bill, it appeared COOL was on its way to being implemented. But meat packers and livestock groups sued the government in an effort to block the rule, and in December, the World Trade Organization authorized Canada and Mexico to issue $1 billion in retaliatory tariffs against the U.S.
As a result, the federal government repealed COOL as part of the federal budget bill, signed into law Dec. 18. U.S. Sen. Sherrod Brown, D-Cleveland, delivered the opening address at the convention. He said he’s working with OFU on developing a voluntary labeling program, but said he believes the program should really be mandatory. “Why should the public be denied knowing where this beef came from or where it was slaughtered?” he asked. The OFU welcomed two additional lawmakers, U.S. Rep. Marcy Kaptur, D-Toledo; and Ohio Rep. Brian Hill, R-Zanesville. Both were named OFU legislators of the year, for their work on COOL (Kaptur), and CAUV reform (Hill). The OFU also presented awards to its own members, including the Certificate of Achievement honor, which went to Holly Finnarn, of Darke County; and Mardy Townsend, of Ashtabula County. Another big concern for OFU members is the trade proposal known as the Trans-Pacific Partnership — a trade deal among a dozen nations, including the U.S. Supporters of the deal, including President Obama, say it would engage the U.S. in one of the world’s biggest economies, boost domestic GDP and provide new opportunities for agriculture. 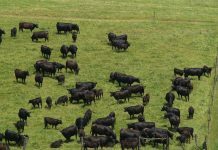 The agreement is expected to reduce and eliminate tariffs, and open new market opportunities for U.S. livestock markets, including beef exports to Japan. But opponents, including Brown and Johnson, point to concerns over currency manipulation by other nations, and the potential for job loss in the U.S.
Johnson said the deal would increase the U.S. trade deficit, and lead to more jobs being exported. “The biggest single reason that we have those trade deficits, is because there are countries who deliberately intervene in the currency markets, to make their exports cheaper, and to make our exports more expensive,” Johnson said. 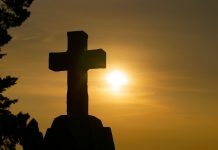 Johnson also criticized the U.S. EPA’s decision to reduce the renewable fuel standard, which he said will lessen the nation’s investment into alternative energy. He also commended OFU members for their work in helping make the new federal food safety rules more scale-appropriate for small farmers. In other matters, OFU President Joe Logan was elected to another term, by a vote of applause. He said the organization also continues to be a “preeminent advocate” for open, transparent and competitive markets. In policy hearings, members discussed their ongoing concerns with large-scale livestock farms, known as Concentrated Animal Feeding Operations. Some members noted they were concerned about the over-application of manure, and nuisance issues related to CAFO operations. 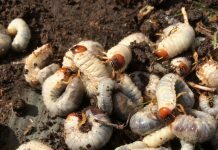 The organization had wanted Ohio’s new fertilizer certification law to include manure applied to farmers’ fields, the same as it applies to manufactured fertilizers. But lawmakers dropped manure — partly because manure is already regulated in Ohio — through separate legislation. The largest farms — CAFOS — are regulated through the Ohio Department of Agriculture’s Division of Livestock Environmental Permitting. Registration is now open for the National Farmers Union convention, which will be held March 5-8, in Minneapolis.